That social space is called the Launch Bay, and as producer Mike Gamble tweets, it’ll allow you to “hang out with your friends, use the forge, reload and grab a new contract,” with support for up to 16 players. That tweet comes with a brief clip of the hub in action – plenty of emotes, as you’d expect – but more details are coming soon. Gamble adds that “We figured that we could show you before launch how we plan continue to be after launch,” suggesting that the Launch Bay’s introduction was a direct response to fan feedback – and that you can expect more reactive development as the game goes into its live service phase. The Launch Bay will be available on the Anthem release date, but you won’t see it in the demo – which kicks off this weekend for folks with VIP access. 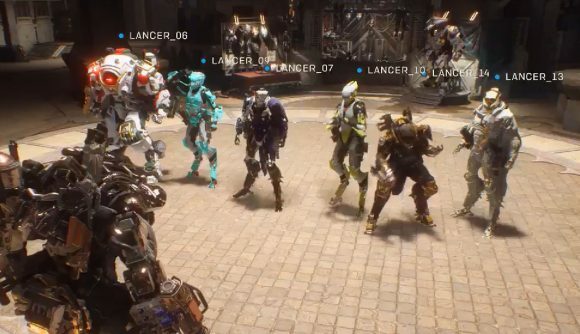 If you’re looking for more info heading into launch, we’ve got a breakdown of what to expect from the Javelins, as well as the Anthem system requirements. Anthem will hit shelves on February 22, so we’ll finally learn how BioWare’s foray into persistent online shooting will play out.